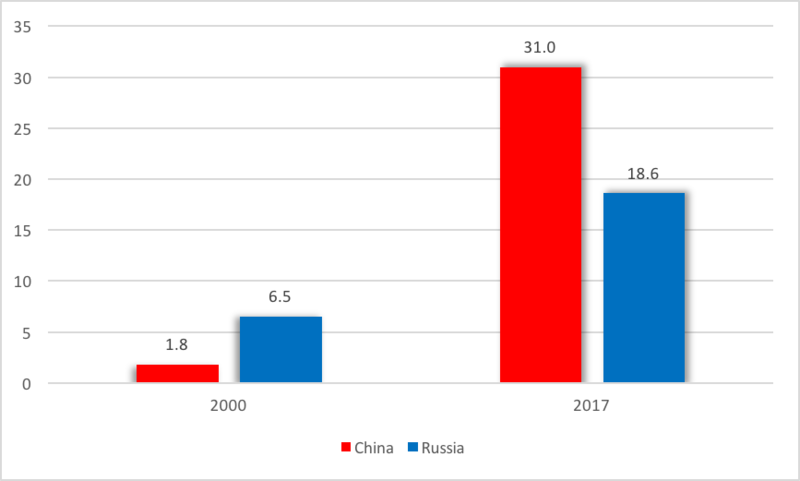 There has been a significant convergence in the relation between Russia and China since the mid-2000s. A decisive role was played in this trend by the complementarity of the two economies as well as certain considerations of the powerful nations, including the common rejection of the USA’s hegemony and the need to jointly manage the issues of Asia. The Western sanctions that had entered into force following the annexation of the Crimean Peninsula by the Russians made the ties between the two countries closer, which now identify each other as the most important strategic partners. However, despite these developments, the majority of politicians and experts who monitor the relation of Russia and China continue to regard their cooperation as fragile for geopolitical reasons. One of the major causes of tensions is the Central Asian region, to which both major powers have tried to extend their influence several times throughout history. The efforts to gain influence over Central Asia has been named the “Great Game” by analogy with the competition of the 19th century. The present study examines the resources of power that Russia and China can use to consolidate their influence in the Central Asian region in the near future. The term Central Asia can currently be interpreted in several different ways, including the historical and the Soviet historiographical definition as well as the one used by the UNESCO and the modern geopolitical explanation. “Central Asia” as a distinct geographical term was first mentioned in a book by the Prussian Alexander von Humboldt, who is considered one of the founders of geography. According to the established interpretation, by Central Asia we mean those Asian regions which lack access to the oceans. Following this logic, the Central Asian region includes Kazakhstan, Kyrgyzstan, Uzbekistan, Tajikistan, Turkmenistan, Mongolia, and Afghanistan based on the UNESCO definition. 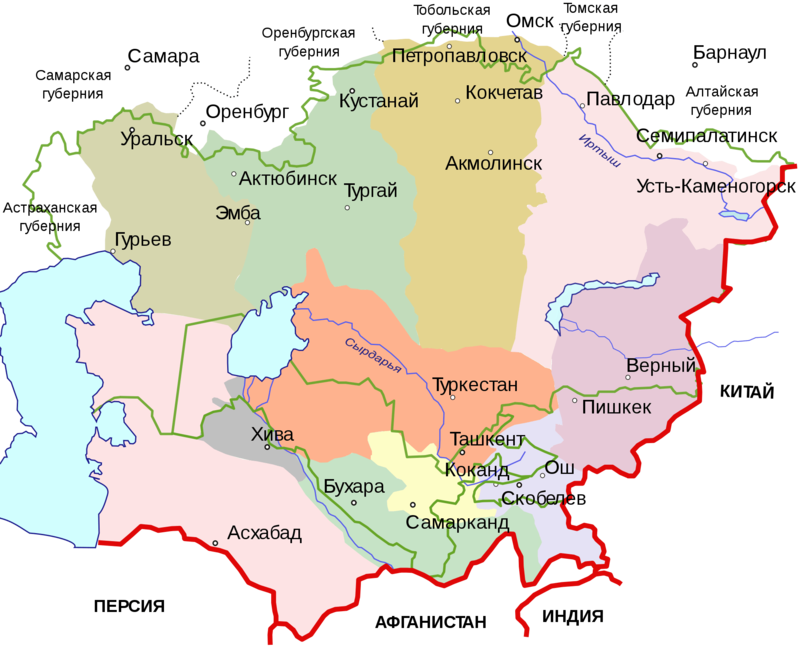 The Soviet definition of Central Asia, used in the 20th century, involved certain parts of China as well, for example, Inner Mongolia, Tibet, and the territory of Xinjiang, but excluded Kazakhstan. In this study, however, we will use the most common geopolitical definition of Central Asia, which includes the following five countries: Kazakhstan, Kyrgyzstan, Uzbekistan, Tajikistan, and Turkmenistan. All of them are post-Soviet countries which gained their sovereignty following the collapse of the Soviet Union in 1991, and the borders of which have taken their present form over the past hundred years in the Soviet system. These are very different states in terms of their areas and economies. The two extremes are represented by Kazakhstan and Tajikistan in fast all aspects: Kazakhstan is the world’s 9th largest state with a territory of 2.7 billion square kilometres, compared to Tajikistan, which has an area of 143 thousand square kilometres. According to IMF data, Kazakhstan is the world’s 54th richest country with its nominal GDP per capita worth USD 10,447 (2019 estimate), while Tajikistan’s nominal GDP per capita is USD 892 (2019 estimate), making it one of poorest countries in the world. Kazakhstan, Turkmenistan, and Uzbekistan extend over an area which is very reach in raw material: Turkmenistan has the world’s 4th largest gas supply, while the areas of Kyrgyzstan and Tajikistan are not rich in raw material. Kazakhstan is also one of the world’s top uranium exporters: In 2014, 41% of the world’s uranium production took place here. The geographical features reflect the economic composition of the five countries: The export of Kazakhstan, Turkmenistan, and Uzbekistan are dominated by petroleum, gas, and uranium and the majority of their revenues come from these. As a comparison, nearly half of Tajikistan’s GDP stems from Tajiks who work in Russia and send their salaries home. In terms of their political system, these are authoritarian states which, in some cases, almost satisfy the definition of totalitarian regimes, where the power lies with leaders who rose to power during the Soviet rule or who gained power through political “inheritance”, rather than democratic elections. The only exception is perhaps Kyrgyzstan, where regime changes have taken place several times over the past decades, in some cases even through violence, and where the current Head of State, Sooronbay Jeenbekov took office in November 2017. Despite this, Kyrgyzstan cannot be considered a democratic country, either. To a varying extent, there is practically no political opposition and a strict censorship is at work in the five countries in question. Gurbanguly Berdimuhamedow’s Turkmenistan is compared to North Korea in terms of isolation and political oppression. Figure 1. 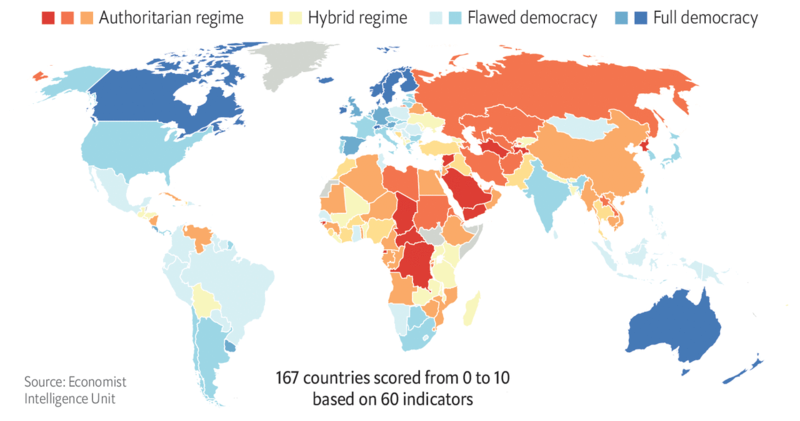 According to the so-called Democracy Index, published annually by the Economist Intelligence Unit (EIU), only Kyrgyzstan was included in the “Hybrid regime” category in the region in 2018. The region’s other four countries were classified as “Authoritarian regimes”. In the study of international relations, gaining influence over a given region assumes an asymmetric relation in which a powerful nation is able to exclusively extend its “hard”’ or “soft” power to that region. In a narrower interpretation, by this we mean the exercise of military or political power, but in a wider context, economic dependence or the tightness of cultural and historical connections combined with institutions and ties of alliance and partnership can also be an essential source of controlling a given region. With respect to Central Asia, the asymmetric relation in terms of capacities is clear in the case of both Russia and China. 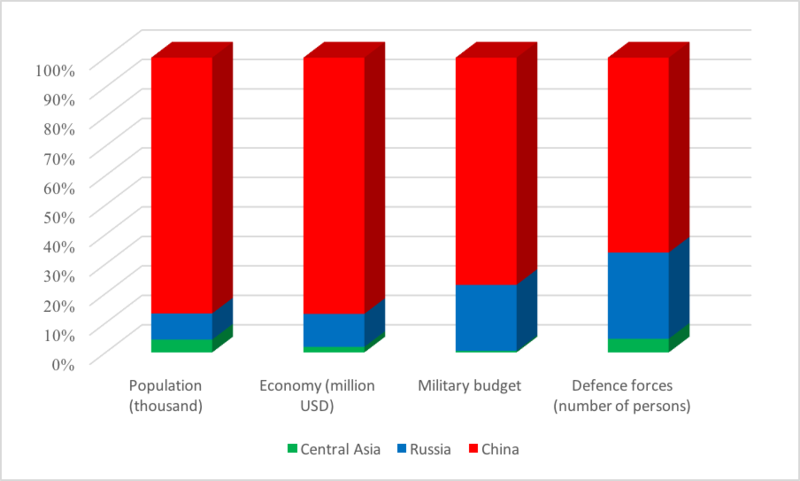 The demographic powers, economies, military forces, and budgets of the two countries far exceed those of Central Asia (Figure 2). Although the present study focuses on the rivalry between Russia and China in Central Asia, it is definitely worth mentioning that the region is not the subject of the exclusive competition between the two major powers in question. Several nations have tried to exploit the power vacuum created after the collapse of the Soviet Union, and these efforts have became more and more intensive since the 2000s. The Unites States is increasingly present in the region, whose primary goal is to increase its military presence in Central Asia. Its strategic goals include the neutralisation of Central Asia and offsetting the Russian and Chinese influence as well as preventing the region from religious radicalisation and decreasing Iran’s influence. Other players in the race for power include Turkey, Iran, India, and, although to a lesser extent, the European Union. It is, however, undeniable that Russia and China have the greatest influence over the region, and the authors’ position is that its political and economic future will be determined by these two powerful nations. Central Asia, in its current situation, has significant economic, geographical, and political characteristics: it is very rich in raw material, which the energy-intensive economies of the region’s major powers badly need. Despite the abundance of raw material, however, the five Central Asian countries have only limited access to international markets, so their commerce can take place only in a well-defined closed area. Apart from Uzbekistan, there is only one country in the world (Lichtenstein) which has to pass through two other countries to reach sea ports. Furthermore, the distance between sea ports and each of the five countries is among the longest in the world. Since infrastructure in Central Asia was in most part created during the existence of the Soviet Union, the region is highly dependant on the transportation system of Russia. The investments of China’s “One Belt, One Road” projects aim exactly at changing this, but currently there is still an infrastructural dependence on Russia. Another feature of the region is the high unemployment rate and, at the same time, the lack of qualified labour force because qualified young workers seek employment abroad, primarily in Russia in hope of better economic circumstances. The region’s economy is not competitive and is characterised by a severe capital shortfall. Therefore, the five states face a fierce competition for foreign investments. The five Central Asian states do not maintain very good relations with each other, which are characterised by border disputes, tariff wars, and diplomatic isolation. If they worked together, it would benefit the whole region: according to a previous UN report, the cooperation of the Central Asian countries could double the region’s GDP in ten years. The change of power in Uzbekistan in 2016 could change this situation: following the death of Islam Karimov, who had risen to power in the Soviet era, former Uzbek Prime Minister Shavkat Mirziyoyev became President. Mirziyoyev has announced a policy of political and economic openness and taken several steps to settle the relations with neighbouring countries. In order to have a perspective on the criterion of exclusiveness linked to the definition of the power over the region, next, we will compare the sources of power in term of China’s and Russia’s regional influence. By the 19th century, first Kazakhstan gradually, then the rest of Central Asia, examined in this paper, came under the rule of the Russian Empire. It was in this period, by the mid-19th century that a geopolitical – and sometimes bloody – fight evolved between the Russian Empire and the era’s other great power, the British Empire, which went down in history as the “Great Game”. The expansion by the Russian Empire served a two-fold goal: on the hand, the protecting its borders against Central Asian tribes, primarily living a nomadic life then, and on the other hand, halting the expansion of the British Empire. The British Empire used all available instruments to prevent Russia from reaching the ocean, and was also worried about the possibility of losing India, the jewel in the crown of the British Empire. Finally, both powers halted at the territories of Afghanistan. The Central Asian expansion of Russia became an important ideological element both in the Tsarist system and the successive Soviet Union led by the Bolsheviks: according to data from 1897, Central Asia was inhabited by more than 7.7 million people, and they tried to win the favour of this population. The Tsarist regime needed their support to continue the military expansion, while the young Bolshevik state needed allies. So the main ideological motto was “development”: it emphasised the technological development of the underdeveloped, poor areas first by the Tsarist and then by the Soviet system. Beside this, by the 1920s, the former Tsarist colonial politics were replaced by a sense of national unity, and a policy building upon history and common culture, which helped the Communist regime to survive through alliances with Asian peoples. They provided employment quotas to Asian indigenous people, took measures to fight illiteracy, supported national languages and cultures and helped clans that had lived separately to assimilate into nation states. After 1924, all this resulted in the creation of new Central Asian countries along national languages and new national ideologies. Figure 3. Central Asia in Tsarist Russia. The coloured areas indicate the administrative units of the Tsarist Empire in their early 20th century form, while the light green lines show the borders of today’s nation states. This trend, which had had a particularly positive effect on national integration, ended in the late 1920s, when the strengthened Soviet Union under Stalin’s rule returned to colonial politics. National development, from then on, was considered harmful and dangerous to the integrity of the Soviet Empire. It was at this time that the active settlement of Slavs in the region was started. As a result of famines following massive collectivisations, nearly 35% of the population (1.5 million people) died in Kazakhstan only. Simultaneously, national cultures and languages started to be restricted and gradually replaced by Russian culture and language, similarly to other Soviet republics. Central Asia became the Soviet Union’s demographic, military, and environmental engineering experimental field, which caused the region to suffer damages that determine the region’s certain features even today. In Uzbekistan, Tajikistan, and Turkmenistan, for example, they tried to create a massive cotton plantation. The plan for the plantation was to cover the needs of the entire Soviet Union. Environmental circumstances were also subject to this project, which led to the Aral Sea drying up. The Soviet system brought about majors changes in term of demography as well. On the one hand, this period was characterised by a massive settlement of Slavs, whose perception and political trustworthiness was more positive than those of the indigenous ethnic population. On the other hand, settlement as a form of penalty also took place: many forced labour camps operated in the region, and the Crimean Tatars, for example, were deported from Crimea to Uzbekistan in 1944 as a collective punishment. Figure 4. 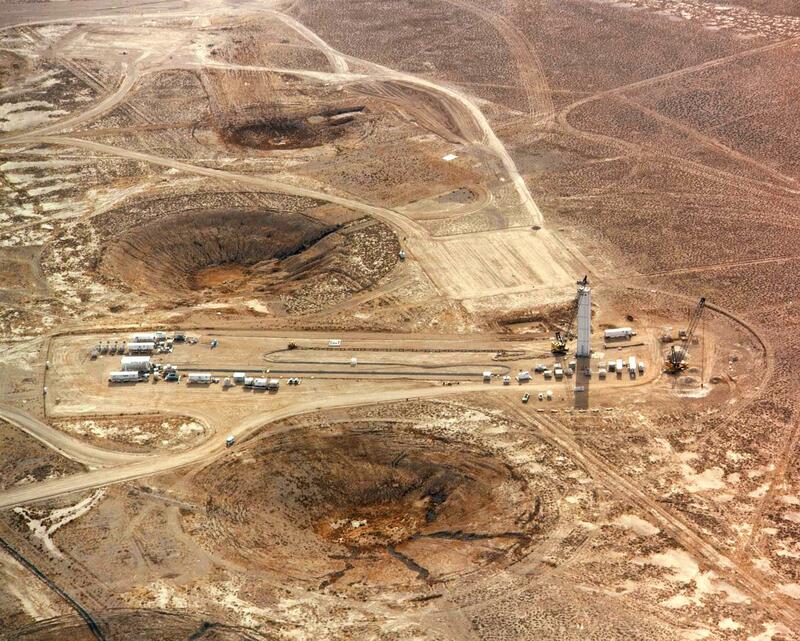 The Semipalatinsk nuclear test site, constructed in 1948. The military base was permanently closed in 1991. Central Asia was used as the primary base for nuclear experiments in the Soviet Union. On the one hand, it was a poorly inhabited region, and on the other hand, it was protected and isolated from possible attacks. One of the world’s largest nuclear test venue, the Semipalatinsk military base was also constructed in Kazakhstan, where at least 468 nuclear detonations were carried out since 1949. It was here that the first Soviet atomic and hydrogen bombs were set off in 1949 and 1953, respectively. Despite all this, after about two centuries of the Russian Tsarist rule and the Soviet regime, Central Asia has very close ties with Russia, and this is where Moscow’s greatest advantage lies. The old economic supply chains are still functioning. The region’s infrastructure system has been constructed with a link to Russia. Soviet education has left its mark as much of the population still speaks Russian. Although military cooperation has been declining, it was inherited from the Soviet era. In the period following the collapse of the Soviet Union, for the citizens of former Soviet member states, finding a job was the easiest in Russia, and thus a significant number of Tajik, Kyrgyz, Kazakh, and Uzbek people still work in Russia, and sending part of their salaries home contributes much to their countries’ GDP. Central Asia does not have ethnic, linguistic, and cultural connections to China’s core area inhabited by Hans. China’s and Central Asia’s relation is extremely complex from a historical point of view and it’s main characteristic, beside the importance of long-distance trade, is frequent conflicts. The Chinese core area tried to pacify and conquer Central Asia’s nomadic tribes and trading towns which it considered barbarian by continuous expansion, and these efforts were the most successful during the Qing dynasty (1644-1911) and led to the incorporation of the area known today as Xinjiang. In the 1860s, Russia conquered smaller Central Asian territories from China and had a significant influence over Xinjiang until the proclamation of the People’s Republic of China. China’s relation with Central Asia primarily depended on its relation with the Soviet Union. Following Stalin’s death (1953), deteriorating relations were reflected by the fact that the Soviet Union opened its borders to around 60,000 Uyghurs fleeing from China in 1962. After the collapse of the Soviet Union, China first settled the borders with the five Central Asian states to stabilise the region and then began to play an increasingly important economic and political role in their lives. The region’s population does typically not trust the Chinese government in power, which significantly reduces China’s options of soft power. To counterbalance this, China has invested a significant amount of resources over the past years in creating a more favourable image of the country in the eyes of the region’s population. In so doing, it has placed an emphasis primarily on the importance of people-to-people relations, which include establishing cultural institutions and granting generous scholarships. Five Confucius Institutes have been founded in Kazakhstan, four in Kyrgyzstan and two in both Uzbekistan and Tajikistan. Furthermore, currently 14,000 Kazakh students study in China. The key element of China’s soft power is definitely its economic power. The past decades have justified that China can successfully modernise its economy, which can be an example to other states as well. Furthermore, China has such an economic force that encourages leaders of Central Asian states to adapt to Beijing’s politics. One of the most important institutions determining Central Asia’s political structure is the Eurasian Economic Union (EAEU) created in 2015 with the leadership of Moscow. The EAEU currently has five member states: Armenia, Belarus, Kazakhstan, Kyrgyzstan, and Russia, so two out of the five Central Asian countries are members. In the first stage of the Eurasian Economic Union, a customs union was created in 2010 by Belarus, Kazakhstan, and Russia, and later, in 2014 joined by Armenia and Kyrgyzstan. The Customs Union established a single customs area between the participating countries with tariff-free internal borders and a protectionist common system of tariffs along the external borders. The next step was the Eurasian Economic Space, which came into existence in 2012, consisting of the members of the Customs Union: i.e. Belarus, Russia, and Kazakhstan (and again joined by Armenia and Kyrgyzstan in 2014). The Eurasian Economic Space is a form of state integration, too and its goal is to ensure the free movement of goods, services, labour, and capital. Finally, the Eurasian Economic Union was founded in January 2015 by the above mentioned five countries as the culmination of the integration that had taken place before, and it practically involved the Customs Union as well as the Eurasian Economic Space. This is not merely a community of economic interests, the plan is rather to realise a closer integration which would culminate in the creation of the Eurasian Union. According to Russian Head of State Vladimir Putin’s vision, this would be the ultimate integration of the post-Soviet and Eurasian region, which would encompass member states in a supranational political system in the economic, political, military, and cultural areas. Thus a sort of post-Soviet Union would be formed, which would again incorporate Eurasia’s territories with a Tsarist and Soviet history into an empire. And for this, the participation of the other Central Asian countries would be indispensable. Tajikistan is the closest to realising this as EAEU accession negotiations have been ongoing for years. The integration of Uzbekistan and Turkmenistan is not really making progress: the truth is that Russia cannot offer much to these countries and they would voluntarily not give up their national sovereignty. The economies of Kazakhstan and Belarus has been very much interconnected with that of Russia so their accession to a political and economic system led by Moscow was a logical a step. It is worth mentioning that the plan of Eurasian integration in the early ‘90s is, in fact, linked to Kazakhstan’s leader, Nursultan Nazarbayev. Armenia had no other choice due to its complete isolation, while such an integration project offers many benefits to Kyrgyzstan and Tajikistan, which lack raw material and constitute poor countries in Central Asia. We should also point out that 4+1 out of 9+1 members of the Commonwealth of Independent States (CIS), created at the dissolution of the Soviet Union, are Central Asian countries. Turkmenistan is in a special situation as it ratified the Treaty for the Establishment of the CIS but did not sign the CIS Charter and, therefore, is officially an associate member state. The role of the CIS, however, has been limited to a role of coordination and it functions as a sort of cooperation platform. The weight of the CIS has further declined with the creation of the Eurasian Economic Union and Georgia’s and Ukraine’s exit. China’s political influence in Central Asia continues to be limited compared to Russia. China adopted a comprehensive strategic agreement with Kazakhstan in 2013, which suggests one of the closest bilateral relation in Chinese diplomacy. Kyrgyzstan, Tajikistan, Turkmenistan, and Uzbekistan appear as strategic partners, which shows that these countries bear less significance to Beijing. On a multilateral level, to the Central Asian region, the most important international institution relevant to China is the Shanghai Cooperation Organization (SCO), which is the successor of the Shanghai Five group, founded mainly for security policy reasons in 1996. This latter included, in addition to China and Russia, Kazakhstan, Kyrgyzstan, and Tajikistan as founders and it was reformed in 2001 with Uzbekistan among its members. Turkmenistan is still not a member of the organisation. The SCO has undergone a major change since its foundation in terms of its goals and institutions. Analysts have typically described the early stage of the period initially focusing on the more narrowly defined Central Asia as an agreement between Russia and China on the division of the region: while the region continues to be under Russian political and military influence, China is granted economic access to the region. However, because of Russian economic and demographic issues, the common belief has spread that the agreement favours China in the long term due to the priority of economic factors. With the accession of India and Pakistan in 2017, the SCO covers most part of the Eurasian continent. Due to this, however, it will serve China’s interests less distinctively in the future, and cannot be considered an Eastern Asian regional institution, whose primary goal is to consolidate China’s regional power. Another major geopolitical initiative of China relevant to Central Asia is the “One Belt, One Road” project, which was announced by President Xi Jinping in September 2013 in Kazakhstan. It aims to lay new foundations for Eurasia’s system of connections, which includes the harmonisation of national policies, the development of new physical infrastructures, ensuring barrier-free trade, financial integration as well as strengthening relations in the human resources. The backbone of the new interconnections are the so-called economic corridors, in which Central Asia plays a key role. The New Eurasian Land Bridge ensures connectivity between China and its most important market, the European Union. The region’s countries are important supporters of the “One Belt, One Road” initiative because they believe in the expansion of interregional trade and the benefits offered by growing Chinese infrastructure investments. This is reflected in the fact that, with the exception of Tajikistan, all Central Asian states participated at the highest level in the Belt and Road Forum in Beijing. To Russia, one of the most important organisations for military cooperation in the region is the so-called Collective Security Treaty Organization (CSTO). The CSTO replaced, in part, the Warsaw Pact from 15th May 1992 on. It has six members: in addition to the five member states of the Eurasian Economic Union (Armenia, Belarus, Kazakhstan, Kyrgyzstan, and Russia), it also includes Tajikistan. Azerbaijan, Georgia, and Uzbekistan used to also be among its founding states, but they left the CSTO over time. Through the Organisation, which protects the sovereignty, territory, regional security, and stability of its member states, Russia maintains several military bases and a Russian military staff of around 13 thousand in Kazakhstan, Kyrgyzstan, and Tajikistan, and they also organise regular joint military exercises. 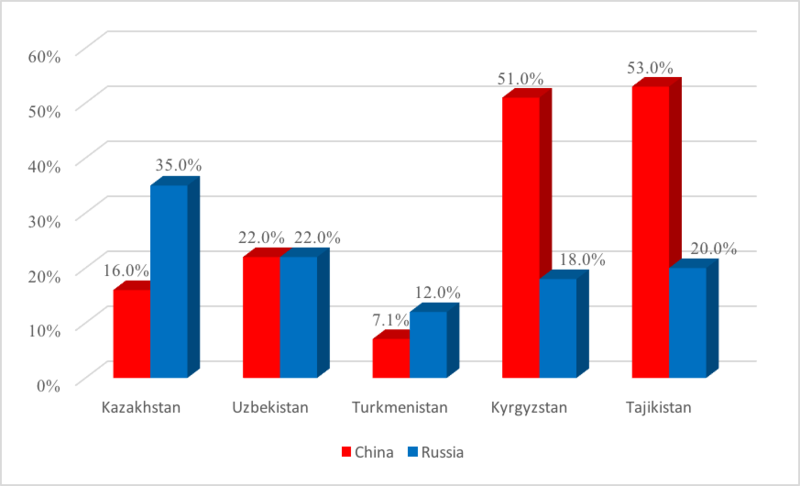 China’s military engagement in the Central Asian region is significantly smaller compared to that of Russia: it has not concluded an agreement of alliance with either Central Asian states, neither has it any military bases within their territories. At the same time, China and the Central Asian States have several military agreements in force, the purpose of which is to harmonise the fight against separatism and terrorism. This is extremely important to China because it wants to prevent the support in Xinjiang of the separatist ambitions of the Muslim Uyghur minority, which lives in China and is ethnically related to the population of the region’s states. The most important institution in the area of military cooperation is the Shanghai Cooperation Organisation, which, among others, also focuses on the above issues. The member states of its predecessor, the Shanghai Five group already agreed in the Dushanbe Declaration in July 2000 to act together against separatism, religious extremism, and terrorism. China and Russia have later pledged to guarantee the political stability of member states through the SCO, and assist them in handling anti-government “colour revolutions”. Furthermore, the member states also regularly hold joint military exercises. China along with Russia is a participant in the CICA (Conference on Interaction and Confidence-Building Measures in Asia) intergovernmental forum, proposed by President Nursultan Nazarbayev, the objective of which is to promote cooperation in the area of security policy in Asia. However, the forum does not provide an opportunity to China to influence Central Asian states through it. Finally, China’s regional arms export (mainly to Turkmenistan) has been of growing importance in the past years, but it continues to be insignificant compared to that of Russia. Over the past few years, the economic influence of Russia in Central Asia has steadily decreased. This process has several reasons: on the one hand, China’s exponential economic growth over the past decades has inevitably entailed the expansion of its economic influence into the neighbouring region. On the other hand, China’s growth coincided with Russia’s economic problems and international isolation. All this led to China replacing Russia due to the latter’s gradually declining economic power. The central political stabilisation in Russia since the early 2000s, the securing of energy revenues and the soaring of international oil prices ensured growth and made Moscow’s initial integration projects attractive. This trend was stopped first by the 2008 global crisis, then by the sanctions and the drop in oil prices following the annexation of Crimea in 2014. In the current situation, therefore, there are no available funds to finance foreign Russian projects and the economic growth and consumption has come to a halt. What is more, as an inherent consequence, migration from Central Asian countries to Russia has also been reversed: high inflation, unemployment, and the depreciation of the rouble make it less and less attractive to look for work in Russia. Thus the former traditional partners of Russia naturally seek new opportunities and China is eager to help them. China is motivated by a number of interests to increase its economic influence in Central Asia. Above all, the region has valuable resources (Kazakhstan is rich in oil and ore, Uzbekistan in gold and natural gas, and Turkmenistan in natural gas as well). Second, the region is an increasingly important trading partner to China and an investment area of growing importance, particularly in the mining, infrastructure, telecommunications, and real property sectors. Finally, the region has a major potential in transit towards Europe and the Middle East, which receives particularly high support from Beijing since the announcement of the “One Belt, One Road” initiative. Due to the above factors, China has played in increasingly decisive role in the economics of the region since the 1990s and has by now become a more important partner than Russia. China has now become a more important trading partner than Russia for all of the Central Asian states, except for Kazakhstan. It plays a particular vital role in Tajikistan’s and Kyrgyzstan’s imports (Figure 7). A significant part of imported Chinese products is exported to neighbouring states. China’s share of Turkmenistan’ exports are particularly high as it is the primary customer of natural gas, which is the Central Asian state’s most important mineral (Figure 6). While China typically exports processed goods such as machinery and electronic products, metal goods, textiles, and plastic to the region, its import from Central Asia is predominantly unprocessed raw material. This asymmetric nature of trade reflects not only China’s higher development status but also the growing dependence of the Central Asian region. China also plays an increasingly dominant role in financing the region: it provides high amounts of aid to poorer Central Asian states, which has become a significant source of revenue in terms of its ratio of the national economy (Table 2). Table 2. Cumulative amount of the aid disbursed by China (ODA) until 2014. Aids, furthermore, are supplemented by concessional loans, whose main characteristic is that they predominantly finance priority projects at a low interest rate (Table 3). Table 3. Cumulative amount of the aid disbursed by China (ODA) until 2014. It is difficult to give a very close estimate of the weight of transfers from China: some sources say that China provides around 40-50% of Kyrgyzstan’s and Tajikistan’s external financial sources, while, in the case of Kazakhstan, this rate is less than 10%. China’s role grew particularly after the crisis of 2007 and 2008, because it started to replace previous Western and Russian financial resources in an increasing rate. It is also difficult to provide an exact figure with respect to investments. According to Kazakh sources, the amount of Chinese investments in the country has been estimated to be over USD 27 billion by the end of 2017. The most important sectors are mining, financial and insurance activities, transport and storage as well as the construction sector and the processing industry. The share of Chinese companies in the economic output of the Kazakh oil and gas industry has now exceeded 40%. Particularly large investments in the region included an oil pipeline between Kazakhstan and China, built via Chinese financial support and delivered by 2006, and a gas pipe connecting Turkmenistan and China, opened in 2014. Due to the economic downturn following the Ukrainian crisis, Russia cannot compete with China as a regional investor. Central Asia is important to Russia and to China for different reasons. For Russia, the region is a source of cheap raw materials – Moscow has access to cheap oil and gas, while it can sell its own energy supplies to Europe at world market prices. At least this was the case until Central Asia depended on Moscow due to is geographical isolation. Thanks to Chinese energy and infrastructure investments, this situation is changing today. On the other hand, Central Asia is an important outlet for Russian manufactured goods: primarily food, machinery, and high-tech products. Central Asia is also important for strategic and security reasons. On the one hand, it plays a role in halting the spread of religious radicalisation, on the other hand, it is, in geopolitical terms, Russia’s periphery and buffer zone; thus, it has an invaluable role as a Russian ally: it is located between several powerful states and regional powers and Russia (China, India, Turkey, Iran). Finally, it is also significant from a domestic political perspective: the emphasis on Russian imperialism and the Soviet past has become a key element of the Russian narrative of power. One of the prevailing ideologies in Russia today is Eurasianism: the ideology of Russia’s unique identity and path and of a multicultural and conservative empire between Europe and Asia. Central Asia plays a highlighted role in this ideology and is an essential element of Russian foreign policy thinking. To China, Central Asia is an intermediate stop, a sort of bridge leading to Europe and the Middle East. In addition, it can be an extremely important instrument in developing Xinjiang, which borders Central Asia and is less developed than other parts of China. Similarly to Russia, it has a significant role as a source of raw material and a potential Chinese market outlet. 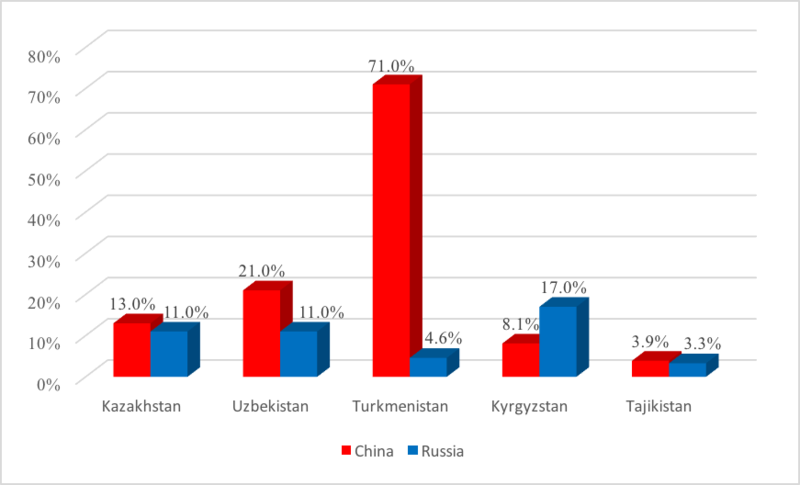 More than a half of the Kyrgyz and Tajik imports are made up of Chinese light industrial goods (see Figure 7), which Kyrgyzstan, for example, resells to other countries of the Eurasian Economic Union. China can currently offer more and more benefits to Central Asian countries and could successfully replace Russia, which has dominated the region so far. China buys the raw materials that Russia used to buy. In addition, the growing Chinese economy requires more and more raw material. China can supply the region with manufactured goods, for example machinery or high-tech goods, that Moscow used to sell. China has become the main creditor and investor in Central Asia. So Russia’s economic and thus political influence is declining and it lacks tools to reverse this trend. The co-existence of Russian and Chinese projects will determine the future of the region, and thus Central Asia will become a sort of neutral space located between the two powerful nations, politically rather belonging to Russia due to the Eurasian Economic Union and the Soviet past; cooperating in military terms with both powers and other powerful countries in the region in the framework of the SCO and the CSTO; while, economically, coming under the influence of China. The projects can thus complement each other and the expected economic development of the “One Belt, One Road” project (BRI) may accumulate the potential economic benefits of the EAEU. Also, the cooperation between Central Asian countries could be the most effective under such conditions, which would bring further economic growth for the region. The other option is that Central Asia will become more and more a region of rivalry between Russia and China. For the economic, strategic, and domestic political reasons previously described, Moscow will not give up its sphere of influence and could even react aggressively to growing Chinese economic power. The Eurasian Economic Union, in this respect, is already a competitor to Chinese expansion as it restricts Chinese exports. The customs policy targeted at the exclusion of Chinese products and the protection of the internal industry has already affected Kyrgyzstan and Kazakhstan negatively, and this is also one of the reasons why Tajikistan is hesitant to join the Union. Furthermore, Russia tries to exert political pressure on Central Asian countries in order to form a common representation of interests vis-á-vis China. China, on the other hand, tries to negotiate with the Central Asian countries one by one and conclude separate bilateral agreements with them. In the long run, this situation does not favour Moscow: China can offer a wide range of cooperation to its Central Asian partners, unlike Russia. In this situation, the SCO may also operate as a military cooperation platform observing and controlling the members’ military activities, which could also prevent any of the major powers to take military steps in such a fierce competition. In such a scenario, China’s “One Belt, One Road” Initiative may not only imply an “economic umbrella” in the region but could also become a competitor to the Eurasian Economic Union in ideological and political terms. To Central Asia, the first option would be clearly the most positive scenario in the spirit of “cooperation”. The second scenario is a zero-sum game for both Russia and China, from which no party can benefit in the short term. This scenario entails tensions and political or even military risks for Central Asian states and could even lead to further fragmentation of the region. We may find out soon, perhaps in a couple of years which direction the region will take. Alexander von Humboldt dedicated his three-volume book, entitled “Asia Centrale” and published in 1843, to Tsar Nicholas I of Russia. PEYROUSE, Sébastien. „Discussing China: Sinophilia and Sinophobia in Central Asia”. Journal of Eurasian Studies 7 (1), 2016. pp. 14-23. BOHNENBERGER-RICH, Simone: China and Kazakhstan: Economic Hierarchy, Dependency and Political Power? Beside China and Russia, Kazakhstan, Kyrgyzstan, and Tajikistan were the five founding members. 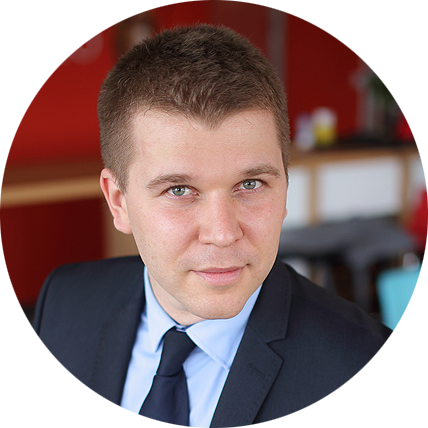 SWANSTRÖM, Niklas: China and Central Asia: A New Great Game or Traditional Vassal Relations? Journal of Contemporary China XIV. (2005). pp. 569-84. Trends in International Arms Transfers, 2017 In: Stockholm International Peace Research Institute, 2018. UURIINTUYA, Batsaikhan, & DABROWSKI, Marek „Central Asia — twenty-five years after the breakup of the USSR”. Russian Journal of Economics 3 (3), 2017. pp. 296-320.